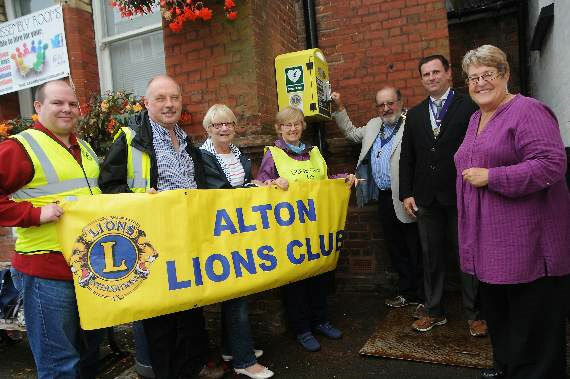 A NEW defibrillator has been installed at the Assembly Rooms, thanks to the ALTON LIONS SUPPORTERS CLUB. The defibrillator is on the side of the Assembly Rooms (because it is a Listed building), next to travel agents Travel Bag. It is housed in a bright yellow cabinet and is easy to see and use and is also compatible with machines used by the ambulance service. The defibrillator has been paid from funds developed through the Alton Lions Supporters Club and has been organized by Lion Sarah o’Donoghue. Club members said they “value our Supporters very much” as they help at events when extra people are needed and provide valuable extra funds. Alton Lions Club Supporters pay £12 per year and whilst some of this money is given out in prizes and the remainder is used for valuable projects like the defibrillator. Alton Town Council has installed the machine at a site of their choice. The council is also covering the cost of insuring and maintaining the equipment. The Lions Club of Alton is always on the lookout for more ‘Supporters’ to help with service in the community and would welcome new supporters at the monthly Craft Market or direct contact can be made by e-mail alton@lions105d.org.uk or call 0845 701 8332. Launching the new defibrillator at the Assembly Rooms, from left, are Lions Bill Tigg, John Mill, Janet Gwynne, Sarah O’Donoghue and Alton Lions president Mike Gwynne with deputy mayor Dean Phillips and Councillor Pam Jones. Next Next post: The Cakes Are Here & Prices Same As Last Year!